There are three ways of starting a trade. I'll go through them separately. I'm not going to go on about trade fairness, because you can find that in the 'Guide to making the perfect trade by Poblakiwi'. FYI: You need to know who you want to trade with first. At the top of every page on the site, in the navigation bar (nav-bar), there is a link labelled 'Trades'. Once you've clicked on that, the following page displayed will be where you choose who to trade with. Most people have set of rule (or guidelines) that they'd like you to follow when trading with them. Sometimes, they will be a bit TL;DR (too long; didn't read), and sometimes they will be short and to the point. Either way, it is best that you read them. You might just end up in the rant thread if you don't. If you don't want to read their rules, then it's best to not trade with that person. Now comes the fun part; adding pets. To add pets, simply click the 'Add pets' button. 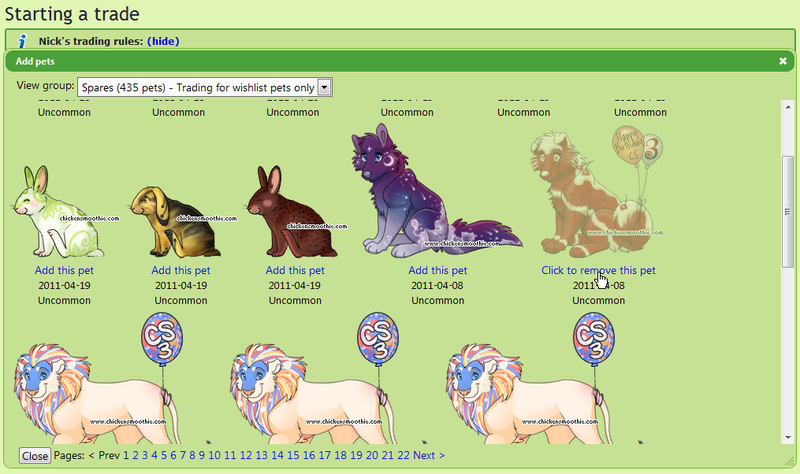 So, to add a pet, click the link beneath the pet you wish to add to the trade. Once the pet is added to the trade, it will fade slightly (as seen above). Then add the pets that you would be giving in return via the same process. You can add Items to a trade as well, by clicking the 'Add more items' link. You can also get to the 'Edit Trade' page by click the 'Trade with me' link on the chosen persons profile. Or straight from a post they have made in the forum. Quite a few people have groups set up within their pets specifically for trading. You can find most of the pets they are willing to trade in this group. 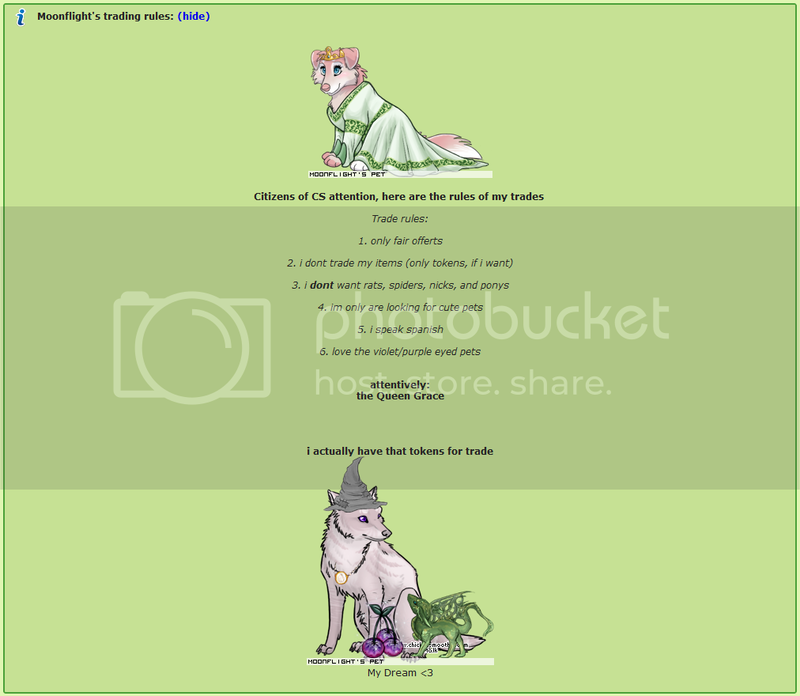 At the bottom of the pet page, there is a link called 'Make a trade offer for this pet...'. 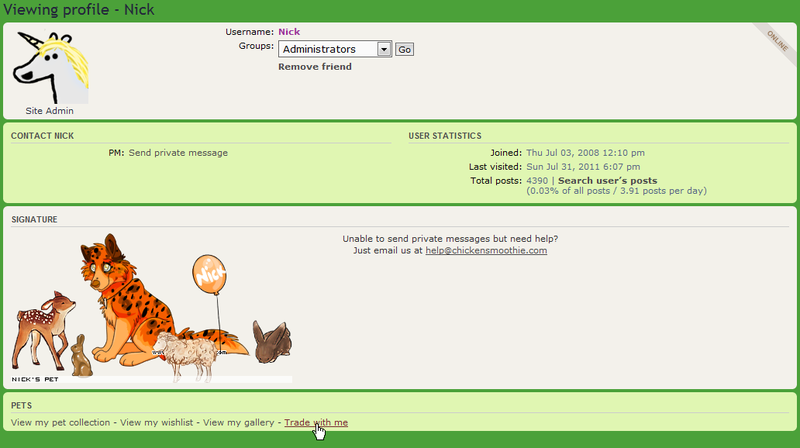 Sometimes, the group may be wishlist only, and so you wont be able to see the link on the pet page. The group needs to be open to all offers for you to see the link on the pet page. That will to take you to our good friend, the 'Edit Trade' page. Just like before, read their rules (if there are any), add the pets you are willing to trade for theirs. Then, to be nice, put in a message. If you leave it blank, they might get confused as to why you are making the offer. At the end of all that, click the pretty little 'Send the trade now' button, and your trade will be sent. You can cancel it in the Trading Center if you want. This page was last edited on 31 August 2011, at 02:35.